Part of visiting an independent shop should be the joy of getting personal, friendly and knowledgeable advice from someone keen to pass on their passion for whatever they are selling. 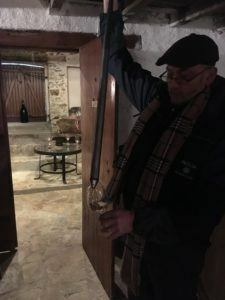 We love sharing our new discoveries with our customers and frequently travel to different wine regions to hunt out some new unrepresented wineries for the shop. Our latest trip encompassed several appellations of the Loire valley including Saumur, Chinon and Saint Nicholas de Bourgeuil. However, we ended in Clisson, South East of Nantes in the heart of Muscadet country. 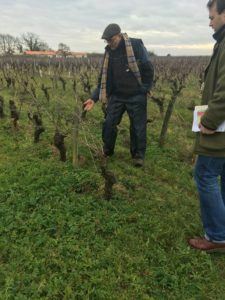 There has been some resurgence quietly going on in Muscadet over recent years, and quality is definitely on the up. The younger generations are taken over the reins and introducing new ideas and techniques. Yields are being lowered and organic viticulture is becoming more common. 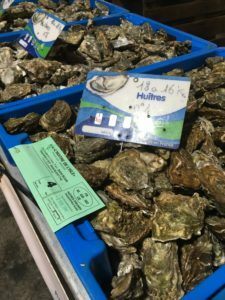 In contrast to more fashionable appellations like Sancerre, and even further to the east Chablis, prices remained reasonable and offer very good value for the quality being offered if you take the time to explore. I’m amazed that a top producer like Poirin Dabin isn’t currently represented in the UK market, so we have decided to change that! Poirin Dabin farm 65 hectares in the commune of Chateau Thebaud, to the south east of Nantes. Vineyards are managed in a sustainable way and certifed under the ‘Terra Vitis’ scheme which is committed to respecting nature and protecting the environment. We are delighted to have selected four wines at the property which we have shipped and are now available to purchase. Unfortunately the Chateau Thebaud 2012 is a limited parcel of just 60 bottles. Matching food and wine is a great passion of ours and with the fantastic produce coming out of Hampshire we feel really lucky to be able to shop for fantastic local produce. 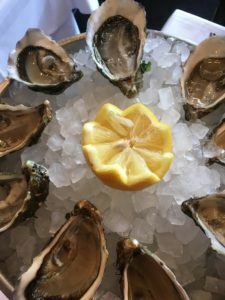 The classic match to Muscadet is oysters, the lively, fresh lemony kick being the perfect partner. It also pairs very well to all other fresh seafood such as Lymington crab or smoked mackerel. Other classic pairings include Spring salads and goats cheese or freshly steamed mussels. Poiron Dabin Sevre et Maine Muscadet Sur Lie Vielles Vigne 2016 *** BUY NOW! This wine made from the Melon de Bourgogne grape spends around 14 months on its lees. This lees ageing gives the wine more body and texture. The wine is dry with bright citrus and apple notes and is also an ideal aperitif. Chateau Thebaud Cru Communal 2012 *** BUY NOW! This wine is from the prime granite vineyard sites of Chateau Thebaud with the wine spending 55 months on lees (minimum regulations are 24 months). The wine has an amazing depth of flavour, riper notes of apple and a touch of acacia honey and a stony minerality on the finish. We would match this to roasted/grilled brill or turbot with hollandaise sauce or shellfish. Val de Loire Sauvignon Fie Gris, 2017 *** BUY NOW! Sauvignon Gris has a slight pinkish hue to its skin, the grape variety is able to ripen slightly more than Sauvignon Blanc which gives the resulting wine a fruitier notes of ripe pear, elderflower and ripe apple. Pair this to Asian food with a touch of spice, but also fuller flavoured dishes such as clams and spaghetti, pasta salads and fish with fresh herb or aromatic marinades. Val de Loire Sauvignon Blanc, 2017 *** BUY NOW! The Loire valley is famous for its Sauvignon Blanc, notably from the villages of Sancerre and Pouilly Fumé. This represents superb value for money with the initial cuttings from Sancerre. Delicate but ripe passionfruit notes on the nose as well as sweet pear. The finish is long and citrus. Every month (roughly!) we send out a newsletter to everyone on our mailing list - sharing wine suggestions and some of our latest in store offers. Opt-out anytime.